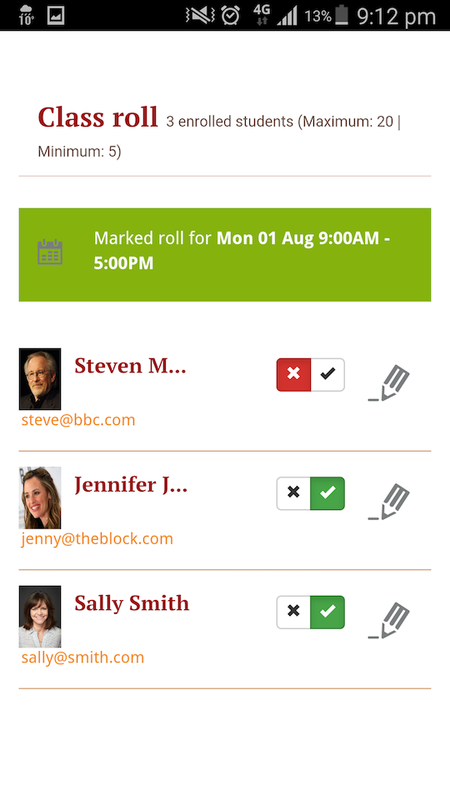 Some features are only visible to tutors, including real time marking of the attendance roll for their classes. Tutors can access the attendance roll for the class they are teaching and mark the attendance records in real time, back to your onCourse database. Only class rolls for sessions in progress, or in the past, can be marked. Attendance can not be marked before the session has commenced. If you have uploaded student profile images in onCourse, their image will appear along side their name assisting the tutors in verifying their identify. 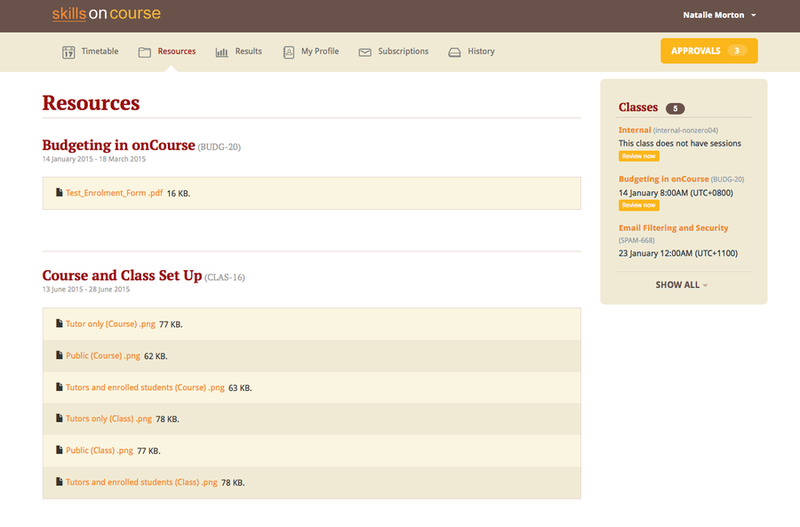 onCourse is also integrated with Gravatar, so if students have a loaded a profile image against a Gravatar profile using the same email address as they use in onCourse, this image will be used. If a student is under 18, their age will show in brackets next to their name. Students can be marked as attended, partially attended, absent or absent with reason. For both partially attended and absent with a reason a note can be recorded against the attendance record to provide more information. Marked attendance data is then used to calculate the student's attendance percentage. This percentage may be important for reasons like CRICOS student visa compliance, or the college's own minimum attendance requirements in order to be eligible for a certificate of attendance. The attendance roll can also list contact details such as mobile and email addresses for students, allowing the tutor to easily contact students as needed. If this is enabled for students who are under 18, it will display the name of their Parent/Guardian and their contact details. A College can set whether or they wish the Tutor to see the contact details of the students via the Website CMS under the Site Settings menu. Whether you want this information displayed is dependent upon the policies of your business and the management of student records. This setting is for all tutors of the college. 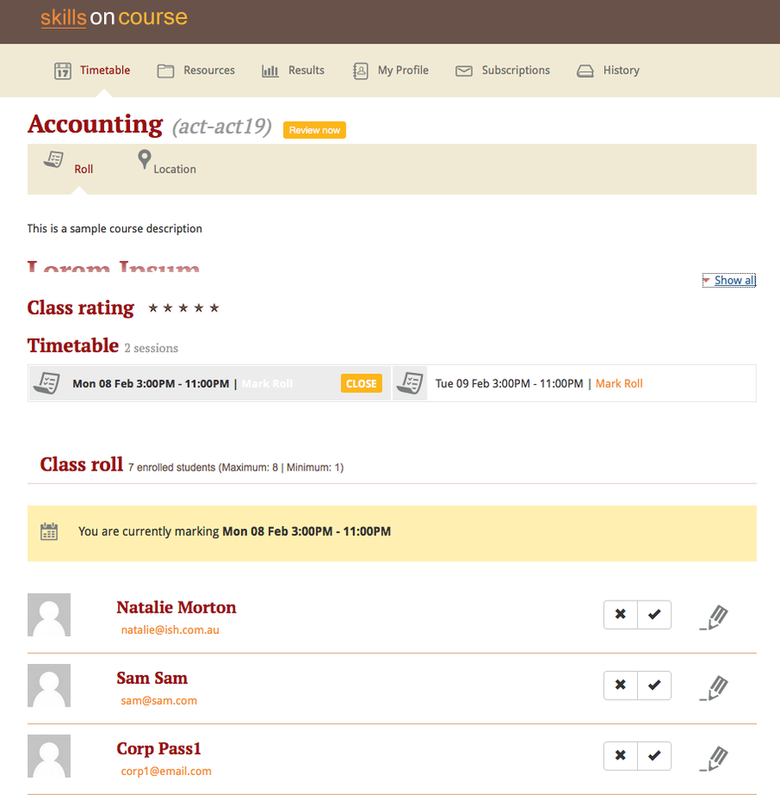 Tutors can confirm their availability for a given Class using the Portal. To access any classes that a Tutor has not yet confirmed their availability for, simply click on the To Confirm menu within the Portal. There is also a dialog box available to the tutor so they can send in comments and or suggested amendments to the course copy. College staff then approve and update the changes via the onCourse Client. Tutors cannot edit the course schedule or description themselves, since it needs to be properly approved by College administrative staff. 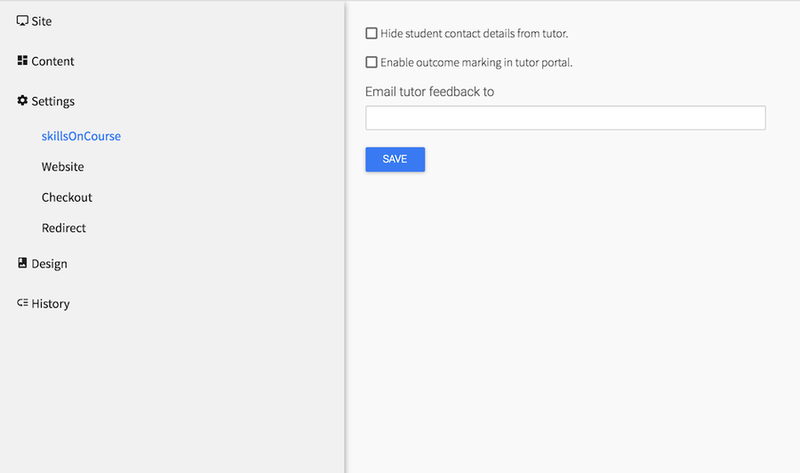 You can give your tutors access to mark their student's outcomes in the tutor portal. This will save time for the tutor and the college, and will give you fast, accurate results in your onCourse database. The system is simple and easy to use for tutors, and has the advantage of updating the onCourse database automatically, so no further staff time is needed to have up to date results for AVETMISS reporting or certificate issuing purposes. If your existing assessment strategy is for tutors to determine competency and notify the college, this system will be easy for you to enable, as it simply moves the notification to an online, integrated platform. Tutors will be able to mark the students competent, not yet competent, no result and withdrawn in the portal. onCourse will automatically assign the correct reporting codes based on the student's enrolment. The tutor is also be able select the date the outcome is marked as the end date of the outcome. This will override the existing outcome end date (or planned outcome end date) in the database. All other VET Outcomes, such as 51- Recognition of Prior Learning (RPL) and 60- Credit transfer (CT) are only available to college staff. This is to ensure the internal processes are meet before they are entered into your database. 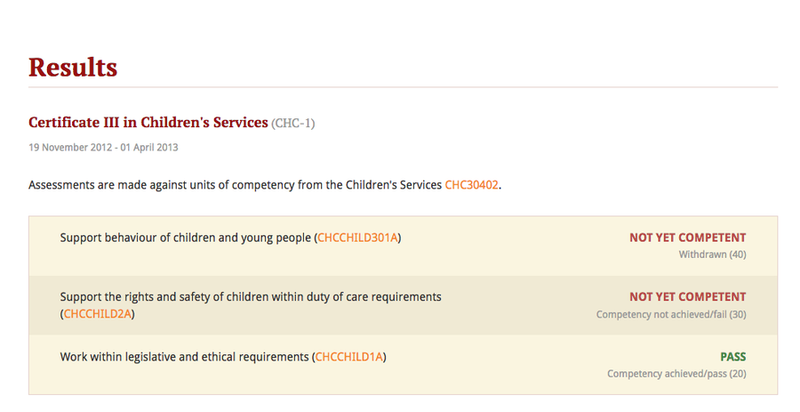 We recommend you have a policy for the tutors that outlines what settings you expect tutors to use. Please feel free to send the tutor instructions or edit them to include your own process with the specific steps and setting for your college. This feature is best for colleges that have a periodic, sample based assessment validation and moderation processes. If your college does ongoing moderation and validation on each assessment, it may be worthwhile considering a shift to a periodic system. Ongoing moderation and validation is a time intensive process that limits access to solutions that improve your overall efficiency and effectiveness. Attendance and outcome marking in the portal enables your college to collect the most update to date and accurate training information from your tutors, and allows for you to access further benefits when combined with default scripts. You can enable marking in your CMS Site settings. Note that this is a single setting for the whole business. If this feature is enabled all tutors will have access to outcome marking. This setting is disabled by default. 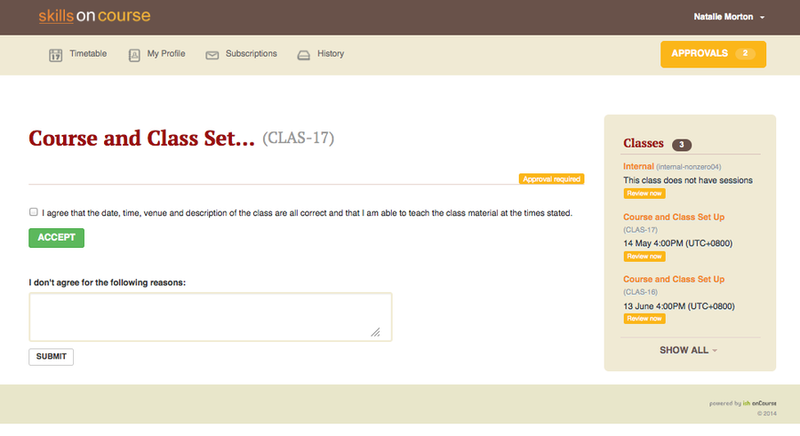 Tutor also have access to a list of resources and files for each individual class they teach. These resources could be teacher training and assessment resources, marking guides or additional course materials. These documents are uploaded via the class or course in the onCourse database with a 'Tutors only' permission. Tutors can also see documents uploaded with 'Tutors and enrolled students' permission, that may include documents like learning guides for students.